If you don’t know it already, Xiaomi recently announced Redmi as a separate brand, quite like what Huawei did with Honor. Redmi Note 7 was launched just few weeks back, making it the first smartphone under the Redmi Brand after Xiaomi separated itself as a brand. At the moment, the new company i.e. Redmi has not hinted anything officially about any new smartphone though the Pro variant of Note 7 i.e. Redmi Note 7 is expected to be launched in China soon. But if the latest leak is to be believed, we may see a new mysterious smartphone named as Redmi X that may be officially unveiled in China in Mid February i.e. on Feb 15. An alleged teaser for Redmi X is spotted on Chinese social network Weibo indicates that the phone could be equipped an in-display fingerprint scanner. The teaser is quite Simple, featuring white background only with a colourful text of “Redmi X” and a date of 15th February. 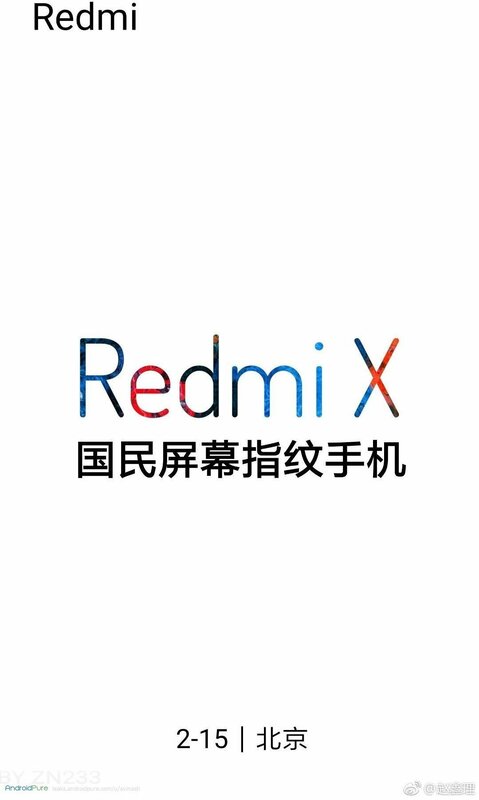 We haven’t heard about the Redmi X before even in any rumours or leaks. There was a concept phone last year, but it proved to be the Redmi Note 6 Pro. If the alleged teaser turns out to be rue, then Redmi X will become the first Redmi smartphone to feature an in-display fingerprint reader.